Washlava is pleased to announce that the company has received formal notification of intent to issue by the US Patent Office for patent No. 10,168,678. This patent, the first of its kind, covers the best of breed technology that interfaces with laundry services and facilities enabling Washlava users to reserve, pay, and control the laundry equipment from a smartphone. “The traditional commercial laundry industry in the United States has failed to innovate and continues to do so. We've advanced the Washlava platform well beyond what they can achieve,” said founder and CEO, Todd Belveal. “This patent, the first of many soon to come, is an indication of not only our superior technical and engineering capabilities, but of our relentless commitment to delivering a seamless, modern, shared laundry experience for the thousands of users we serve now, and the millions to come,” he says. In 2017, Washlava launched the world’s first exclusively smartphone-enabled laundromat with this patented technology. Since then, the company has grown to serve thousands of users across the US and Europe and proven its technology in all forms of shared-laundry markets including traditional laundromats, university campuses, multi-family housing and hotels. This patent comes shortly after Washlava was recognized by industry giant, Electrolux, as the future of shared laundry in Asia. “We are pleased that Washlava’s scalable mobile-first laundry platform and ideas resonated the best with Chinese millennials and the judges, making them the winners among 47 entries we received from all around the world”, said Jaimohan Thampi, Head of Digital Transformation & IoT at Electrolux Asia Pacific. Washlava is the laundry experience that lets customers reserve and pay for machines from their smartphones. 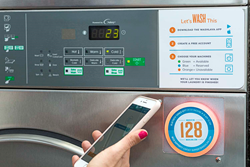 Washlava intends to transform the self-service laundry industry through its patent-pending, smartphone-enabled technology platform and digital brand by creating a connected, convenient laundry experience for businesses and their customers. The company was founded by Todd Belveal, who previously co-founded the Austin-based, mobile-enabled car rental company, Silvercar (now owned by Audi). For more information, visit washlava.com.